Tough Crowd – the exhibition of intimate comedy portraits by Dave Brown – will be given a new lease of life from tomorrow in Norwich. Split across two venues, the collection includes shots of a number of big name comedians. TVO regulars Alice Lowe, Arnab Chanda, Barunka O’Shaughnessy, Dan Clark, Dolly Wells, Joey Page, Julia Davis, Julian Barratt, Kevin Eldon, Kim Noble, Neil Cole, Noel Fielding, Rich Fulcher, Richard Ayoade, Sarah Kendall, Steve Oram, Tom Meeten and Tony Law are just the tip of the iceberg! With the likes of Adam Buxton, Bill Bailey, Bob Mortimer, Chris Addison, Harry Hill, Lenny Henry, Phill Jupitus, Ross Noble and Tim Minchin amongst the various other names featured – and there are many more – it’s a fascinating collection to peruse, and the good people of Norwich can do so from tomorrow – Friday 13th September, until Saturday 12th October. 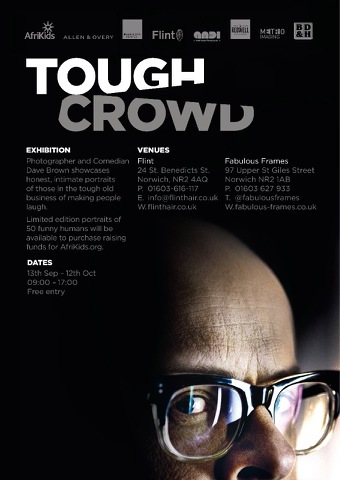 The free to view show is housed by Flint Hair on Benedict Street, and Fabulous Frames on Upper St Giles Street. As ever, there will be limited edition prints on sale in aid of Afrikids, so get on down there and part with your cash. If you can’t make it, the prints are also available on the Afrikids website. If you missed our extensive interview with Dave on all things Tough Crowd late last year, you can swot up on it right now.